Market Rasen provided the backdrop for a great day for lady amateur riders today when 2008/9 Lady Amateur Jumps Champion LUCY HORNER rode her first winner since her premature enforced retirement last November due to an ongoing eye problem. 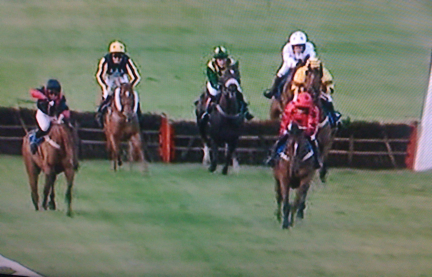 Since then Lucy has successfully undergone eye surgery and resumed race riding a short while ago. Chris Grant’s Aggravation responded to Lucy’s demands to move upsides the leader coming into the straight and battle his way to lead as the line approached. 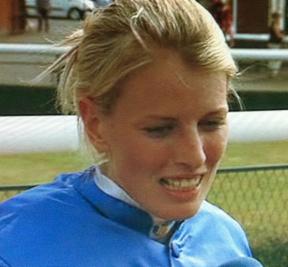 Many congratulations to Lucy on her fantastic return. Later in the afternoon another lady jockey’s success was enjoyed by ALEX SMITH-MAXWELL when she made all the running and stayed on in a driving finish to beat off the relentless efforts of champion jockey Tony McCoy who had been tracking her most of the way. Alex said after the race that she told her horse “Its now or never – the cameras are on us!” and tunnel vision took over as she concentrated on riding her horse to the line. This was the second time that Alex had scored on Public Esteem having won on him over hurdles at Newton Abbot a few weeks ago and was a terrific performance. Many congratulations to Alex on such a memorable victory. What a day for the girls! Only seven weeks after Archie Bartley came into the world, father Gary was literally left holding the baby this afternoon to allow triple ladies amateur flat champion Carol to enjoy a winning comeback ride at Hamilton on Regent’s Secret for Jim Goldie. Under a confident and patient ride Carol delivered a long late run on the inner to forge clear in the final furlong and win comfortably. Many congratulations to winning connections! 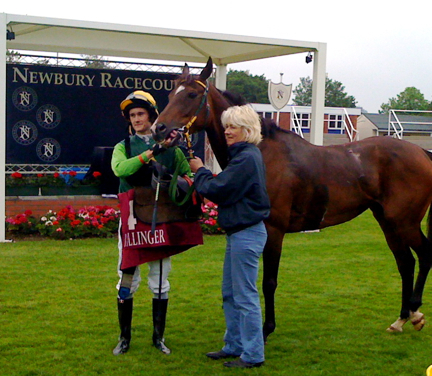 ROSS BIRKETT is pictured above with trainer mother Julia Feilden at Newbury after his recent win there on 10th June in this year’s Bollinger Series for gentleman amateur riders which takes him into the current leading position. A full field of 14 feature this afternoon at Salisbury for the 4th leg of this year’s 8 race series. 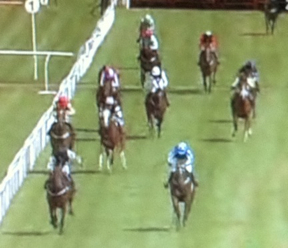 Newton Abbot gives Irish amateur Lisa O’Neill first career winner! There may have only been 6 runners in the final race of the evening at Newton Abbot but the race will live long in the memory of winning Irish amateur jockey LISA O’NEILL as she enjoyed her first winner on her debut ride in England. 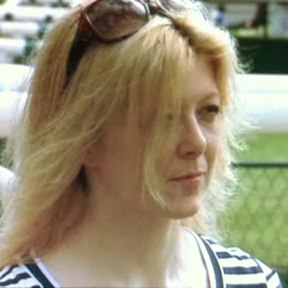 Assistant to trainer father Tommy, Lisa has been placed many times and her experience paid dividends this evening. 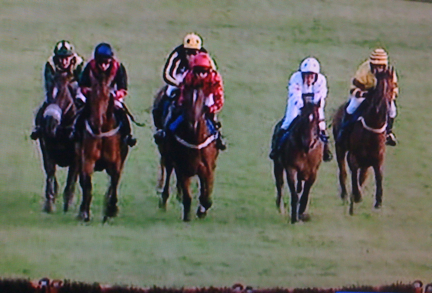 The Newton Abbot Races GB v Ireland Lady Amateur Riders Handicap Hurdle was the first leg of an annual 2 race challenge with 2 teams of 6 lady amateur jockeys representing their respective countries. Ireland ended the evening with 1st, 3rd and 5th places and the return match at Limerick in November is now keenly looked forward to by the girls. Many congratulations to Lisa on a great win! She is pictured above, having jumped the last in front to go on and pass the post to win comfortably on Nigel Hawke’s Vintage Fabric nearly 4 lengths ahead of SALLY RANDELL and Milton Harris’ Bold Policy with EVANNA MCCUTCHEON and Anabel King’s Wisteria Lane in third. Very many thanks to both Jason Loosemore at Newton Abbot racecourse and Russell Ferris at Limerick racecourse for their generosity in making these races possible and to all owners and trainers for their support. 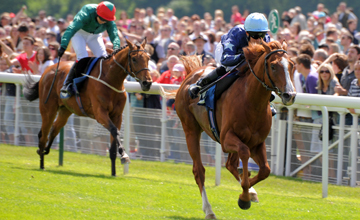 Tuesday evening 22nd June sees Newton Abbot host their annual leg of the Anglo/Irish ladies hurdle challenge with six Irish amateur lady jockeys invited to ride at the West Country course to take on the British team of six, with the return match scheduled to take place at Limerick on 7th November. Good luck to the lady riders! Our reigning lady flat amateur champion SERENA BROTHERTON returned to the scene of her 2001 triumph at Ripon today to excel in the highly competitive 15 runner Beaumont Robinson Ladies Derby Handicap and add her name to this season’s winners tables. Partnering Maneki Neko for Edwin Tuer, Serena was always well positioned and took it up quickly from over a furlong out to score comfortably, with JOANNA MASON and Golden Future 4 1/2 lengths back in second and RUTH JEFFERSON and Choctaw Nation a further couple of lengths in third. RUTH JEFFERSON WINS IN USA! British lady jockeys’ representative RUTH JEFFERSON rode her first winner in the Fegentri series today in Delaware Park, USA. In a thrilling finish, Ruth just held on to win by a neck from Sweden’s Cathrine Engebretsen with France’s Pauline Boisgontier a further neck back in third. This winning ride takes Ruth into 2nd place behind Pauline in the league tables with another race in the US tomorrow at Philadelphia Park before the next Fegentri race is held at Nottingham on 3rd July. Many congratulations to Ruth. Great Britain has been runner-up for the last 2 years in the Fegentri Ladies World Championship but GB has never won the ladies title in Fegentri’s history, so our hopes are high for Ruth. Meanwhile our gentleman jockeys’ representative HARRY CHALLONER flew out to Sweden today for three rides there tomorrow in the Fegentri flat race, the Swedish Champion Hurdle and the Swedish Grand National. Harry then travels to Dieppe on 28th June. The sunshine at York welcomed RACHEL KING to the winner’s enclosure this afternoon following the 23rd running of the Queen Mother’s Cup with a bumper field of 18. Prominent in the early stages of the race were Daaweitza, Twisted and Conquisto ridden by KATIE WALSH, but turning into the straight it was the turn of LOUISE ALLAN on Antiqua Sunrise to take it up and lead into the final furlong. 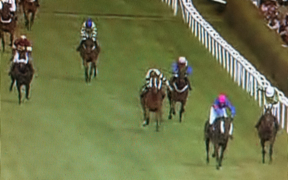 However, Rachel had lined up bottom weight Desert Recluse down the centre of the track for the final stages of the race, riding a well judged run to outstay her rivals and go on to score by 6 lengths. Rachel was scoring for the third time under Rules in her career so far. Last season’s amateur lady champion jump jockey LUCY HORNER finished in 2nd place on Alcalde, with JACQUELINE COWARD 3rd on the on-running Crackentorp and EMILY JONES 4th on Siberian Tiger. After her victory Rachel said “He did it very well. He was the only 3 year old in the field against older horses. He was so game, he never gave up.” Thanks to the customary generosity of Pol Roger, Rachel can now look forward to enjoying drinking her weight in champagne as is the tradition with this historic lady riders’ race. Many congratulations to Rachel and winning connections. 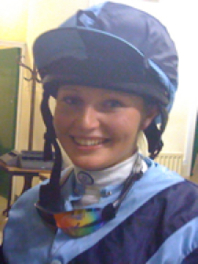 Congratulations to Charlotte Holmes on riding her first Flat winner this evening at Hamilton in only her fifth ride under Rules. Having missed the break, IVESTAR did not look likely to be troubling the judge. However, once the field hit the rising ground, his stamina came into play. With riding instructions of not to make a move until after the 2f marker, at that point Charlotte got to work and her mount responded by running on strongly to lead close home in a tight finish, beating reigning champion amateur jockey Simon Walker and EL DECECY by a neck who in turn finished in front of Justin Newman and FINAL SALUTE by a nose.